It's official. The University of Tennessee in Knoxville has gone to the dogs, but in a good way. The stress of college life can be painful when a pet is left at home. During finals week, the inaccessibility of a pet can be felt acutely. Students at the Wesley Foundation on UT campus came up with a unique way to help. 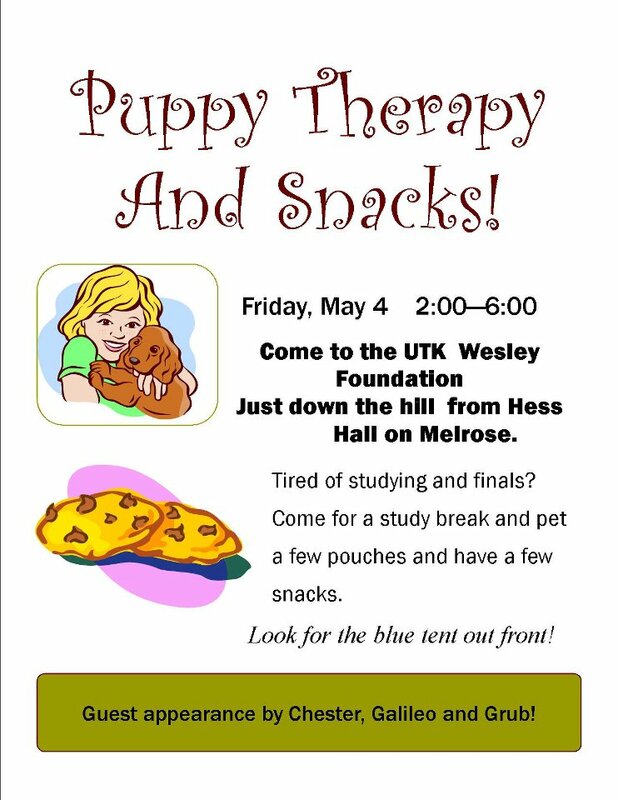 On the Friday before graduation, students were invited out for puppy therapy and snacks. Volunteers and their favorite pet gathered in front of the foundation. A large blue tent was erected on the lawn. Fliers were distributed in advance and shared via social media. It didn't take long for word to spread that the animals had arrived. 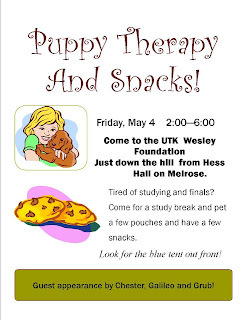 By mid-afternoon a small throng of students had already participated in puppy therapy. Samantha Crabtree is one of the organizers of the event. By her estimation, over 30 students were involved in the project by either receiving pet therapy or by volunteering. Four people brought a pet. Crabtree is quick to point out that not everyone's pet is up to the challenge. She says that it is important to consider the personality of a pet and be sure the animal is well socialized. Just like people, the puppies need to have regular rest breaks, access to water and treats. The event was so well received that they hope to do it again in the fall. Free snacks and drinks for people were available in addition to the pet therapy. The Wesley Foundation in Knoxville is a quiet study spot and offers free WI-FI on an ongoing basis. Students are provided with a support structure in a nurturing environment. The Wesley Foundation is affiliated with the United Methodist Church. As such, it relies heavily on the support of United Methodist Churches and others to make this and other outreach ministries possible. The foundation has a regular Sunday evening worship at 6:00 pm. and is followed by a free dinner at 7:00 pm. Information about the services and supporting the Wesley Foundation can be found on Facebook.